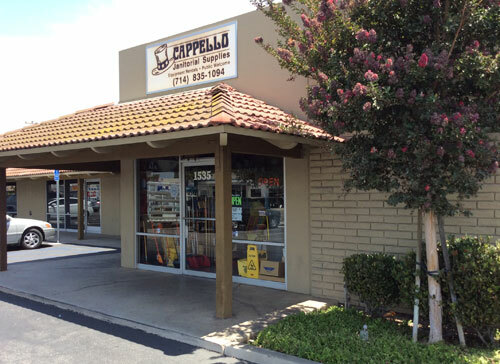 Cappello Janitorial Supplies is a family-owned and operated business based in Santa Ana. With over 50 years of dedicated service, we have the experience to help you with all of your cleaning supply needs, whether you are a homeowner, custodian, carpet cleaner, facility manager, janitor, window washer, house cleaner, maid or building maintenance worker. With expert advice, worry-free service and trustworthy product recommendations, we're confident we'll help you buy the best cleaning supplies for your needs, saving you time, energy and money. We carry dispensers, paper goods, cleaning chemicals, trash liners, floor and carpet care equipment, window cleaning supplies, and more. And, if we don't have what you're looking for, we'll special order it and offer you a great deal. In addition to our large inventory and exceptional sales advice, Cappello Janitorial Supplies offers expert assessment and repair for vacuum cleaners, regardless of the make or model. With more than 5 decades of industry experience, we have the necessary expertise to properly repair your vacuum cleaner. And, because we stock most common vacuum cleaner parts, we will return your vacuum to you in a timely manner. We even offer quality and fairly priced vacuum rentals so you experience as little downtime as possible. Our rentals include a wide selection of carpet and floor care equipment, including floor care machines, backpack vacuums, canister vacuums, buffers, and more--all of which are available for purchase, along with associated accessories and chemicals. Established in 1964, Cappello Janitorial Supplies continues to uphold our founder's original commitment to customer satisfaction, affordable pricing and quality janitorial supplies. We sell only the industry's finest, professional-grade cleaning products, including brand name and private label cleaning items, ensuring we accommodate all price points. We even offer Orange County businesses free delivery, no matter the order size. For our efforts, we have developed a reputable, service-driven reputation among 1,000s of Orange County residential, commercial and industrial clients. To learn more, pick up the phone and call us today; we look forward to helping you with all of your janitorial supply needs.